During the struggle they will pull us down. But please, please let's use this chance to turn things around. And tonight we can truly say together we're invincible I just got back from the hospital where my Dad is there struggling with his illness. He is in much pain and discomfort but he is fighting on, refusing to be pulled down, making me so proud of him as a son. Martina and I sat down to read some lyrics of Muse while listen to their songs, I found this particular song's lyrics very beautiful and inspiring in times like this. I just got back from the second training session with the triathlon club, the training is usually an hour of running and an hour of swimming. On Monday in the first session the swimming was so hard for me that my shoulder was stiff for a day and a half, just relaxed up in time for tonight's session. Then tonight when I was pushing hard for the head above water drill, I kicked so hard that I had cramps in the calf muscle on both leg. A long way to go before I can keep up with these guys but I like those pain and ache in my muscle afterward, a sensation that has been long missed. Martina and I attended not one but two great concerts in a weekend, on Saturday it was one of my favourite Brit Pop band "Muse" in Asia World Expo. Then 24 hours later we went to the world's most loved Senegelese singer "Youssou N'Dour". Both were captivating performance, Muse's live act had so much energy, within a track, their music may swing from soulful piano rythum to a high octane explosive electric guitar display. 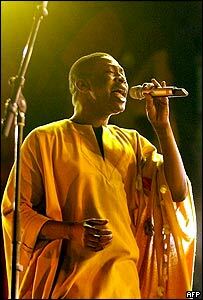 Youssou N'Dour on the other hand played Afrian Music with a variety of styles. His songs imbedded political messages of social justice. In his most memorable song of the night, he said, "This song is about Africa. People often think of only 3 things in Africa, Povery, Aids and War. But there is more to it, there is also happiness." Then he went on to sang the sorrowful song that rings in my head since. Sorry guys, it has been a lifetime since I have updated this blog. As some of you might know, my Dad is suffering some bad illness and hence I just tried to stay with my family as much as I can. Which mean I don't get home till quite late in the evening. I have only spend about 10 mins in front of this computer every night. Setting the sorrow aside my recovery from adventure sports are more or less completed. As a consolation from lunch time bouldering in Kwun Tong, I have joined a fantastic gym 5 mins away from the office in Central. Its 20m swimming pool has served a monumental role in getting my left arm muscle back in swing. My default lunch time pass time has been running on the treadmill, cycling on the gym bike or crawling through the water with a vengence. While on the gym bike I like listening to this podcast from TriTalk, it is a brilliant bi-weekly program on training tips for triathletes and I hope I discover this before Alex does! Coupled with much improved working hours, the condition is now perfect for me to embark on some proper triathlon training. And my first target is a the first ever Half Ironman in Asia, the SinaporeIronman703. I hope to get into the rythum of proper training soon, gonna tried out the Sonic Sports Club next week, which my mate Larry (Kin's partner in crime in Actiona Asia Macau) said it is a nice gang to be with. Inevitably, I don't forsee climbing much this year but something had to give. I have finished reading "The Villian - The Life of Don Whillan". I recommend it in the same passion that I recommended "Leaving Microsoft to Change the World". Don is a genius in climbing and mountaineering, though unfortunately a tragic character that never realised his potential. He partnered with some of the best climbers in his generation first with Joe Brown and then Chris Bonnington. Though cause of his psychological flaw, he felt out with them and brought the most successful partnership in 1950's British rock climbing (with Brown) and a budding partnership in Alpine Climbing (with Bonnington) to a fruitless end. He went on a decade without major successful ascent until 1970, Bonnington saw the fire in him and took him to Annapurna to conquer the South Face of the mountain. He summited the face with Dougal Haston and the feat was a great national achievement at the time. Though even at Don's height he was on his way down, he was portraited as a calculating person who avoid load carrying on the mountain to preserve his fitness in order to get picked for the summit bid. Eventually such bad reputation drove him out of the top league of mountaineering and was never able to met his goal of conquering the North Face of Eiger and the South West Face of Everest. Go and read it, a sad tale of a nonetheless hero of his time.